After a day or two at the resort we learned that we could visit the nearby sister properties for no additional charge, as part of the Sandals Exchange Program. So, for no additional cost, we were able to take advantage of the facilities at Beaches Sandy Bay Resort as well as Beaches Negril Resort, both right now the beach and a short, FREE, shuttle ride to and from. Our vacation experience was enhanced as we realized this meant at least 6 new restaurants to eat at, new bars to drink at, plus a whole variety of additional water activities including the updated Pirates Island Water Park at Beaches Negril Resort (Beaches Boscobel Resort & Beaches Turks & Caicos Resort also have the Pirates Island Water Park). Since our visit, we've become travel agents and opened up our own agency, My Paradise Planner. We are always encouraging our clients to take advantage of the same deals. Some of the time we offer this deal to those clients who don't like to be cooped up at the same resort all week. A majority of the time we offer the deal to clients who are traveling on a budget but still want to be able to experience the "Sandals Difference" or "Beaches difference". You can on the lovely island of St. Lucia and experience not 1, but all 3 of the Sandals Resorts there. 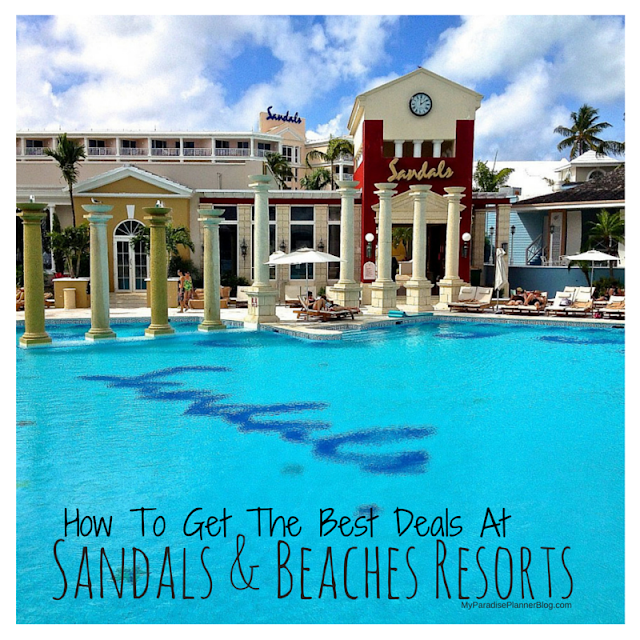 Stay at Sandals Halcyon Beach Resort and play at Sandals Regency La Toc Resort and Sandals Grand St. Lucian Resort! For 6 days and 5 nights from the NYC area for $1,600 per person, including airfare and all of the all-inclusive resort amenities! Or, for only $1,100 per person for 6 days, 5 nights, including airfare and all of the all-inclusive resort amenities, you can stay in beautiful Jamaica, at Sandals Carlyle Inn, in the city of Montego Bay, and play at Sandals Montego Bay Resort and Sandals Royal Caribbean Resort & Private Off Shore Island. Such low prices to visit some of the best resorts in the world! Just another reason why we love Sandals & Beaches Resorts!